What does Apple's 'iOS in the Car' mean for in-car multimedia? Will Apple's plan to take over the in-car experience with iOS work? iOS in the Car: Are you ready to have Apple maps get you home? Apple plans to take over your in-car experience by porting iOS 7 onto dashboards everywhere. But will car makers co-operate? Is it even a good idea for fans of Apple kit? In true Apple style, the plan for iOS in the Car, as it's known, touches on perhaps the most critical question for the future of in-car multimedia. Should it be provided by car manufacturers? Or third party device makers like Apple? Those were the key questions for car lovers that that popped out of Apple's WWDC jamboree on Monday and its iOS in the Car announcement. To recap, Apple didn't go into a huge amount of detail, but what we know about iOS in the Car goes like this. 95 per cent of cars sold today already have iOS music control and playback integration, typically via USB or Bluetooth. But what if you could have iOS displayed on the screen in your car? Or have access to your personal content, use relevant apps like Maps, have your iMessages on-screen or eyes-free using Siri. That's what iOS in the Car is all about. Apple says iOS in the Car is coming in 2014 and will be supported by a wide range of car brands, including Honda, Mercedes-Benz, Nissan, Ferrari, Chevrolet, Infiniti, Kia, Hyundai, Volvo, Vauxhall/Opel and Jaguar. That's an impressive list. 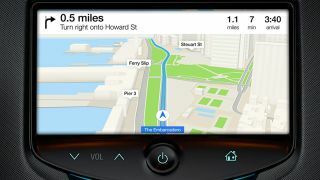 So is iOS in-car inevitable? Is it even a good idea? The argument in favour says that very few companies have managed to create good user interfaces for digital devices. Is it realistic to expect every car maker to produce a great interface based on a unique or proprietary platform? Apple has managed it, so why reinvent the wheel? What's more, do we as smartphone owners and car users really want to learn multiple systems and interfaces? Wouldn't it be better if we could learn just one – in this case iOS – and have a consistent experience regardless of the device we happen to be using? Then there are related issues of apps and personal and social data. If every car maker has its own system, are developers going to have to create an app for every brand? Wouldn't it be better to be able to release one app that works on all or at least most cars? And if you've commited to iOS as the platform that manages your personal and social networking data in the cloud, doesn't it make sense to have iOS serve that up in cars, too? It sounds compelling, eh? But here's the counter argument. For starters, in-car multimedia is increasingly a major differentiator for car makers. If they merely hand the job over to Apple. Why should you by their car over a competitors? Then there's the safety angle. What does Apple now about the difficult question of driver distraction? In fact, what does Apple know about in-car interfaces in general? It's a very different challenge to a smartphone or tablet. Then there's the simple fact that a wide range of functionality will have to remain the purview of car makers. They're still going to have to make the core systems that control the driving dynamics, driver's aids and more. And increasingly, those systems are closely linked. For instance, some cars now use navigation data to pre select a gear for an upcoming corner. Doesn't that mean that a car can't rely upon the user to bring his iPhone? With all that in mind,it's not huge surprsing to find at least some car makers are already outing themselves as refuseniks. BMW has come out as being unsure about participating with iOS in the Car (see our story here). That BMW isn't on board is intriguing given it has to date been one of the earliest and most enthusiastic adopters of iPhone integration in the car. Put it all together and iOS in the Car poses lots of critical questions about the future of car technology. It'll be fascinating to see how it all plays out.